Demand for new heavy goods vehicles falls -7.0% in Q3 to 9,853 units. Declines for both rigids and artics, down -9.8% and -3.1% respectively. 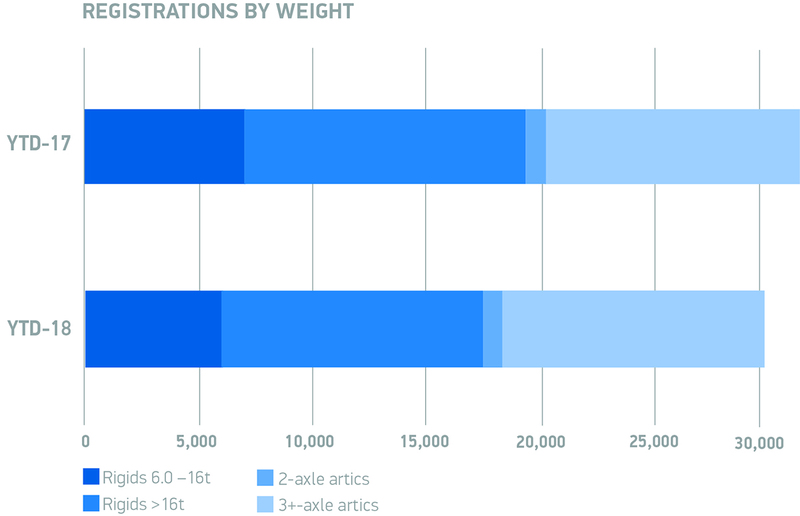 30,308 HGVs registered in the nine months to September, representing a -7.5% decline. The UK new heavy goods vehicle (HGV) market declined -7.0% in Q3 2018, according to figures released today by the Society of Motor Manufacturers and Traders (SMMT). 9,853 heavy trucks were registered between June and September, a result of fluctuating fleet buying cycles and ongoing falls in business confidence. 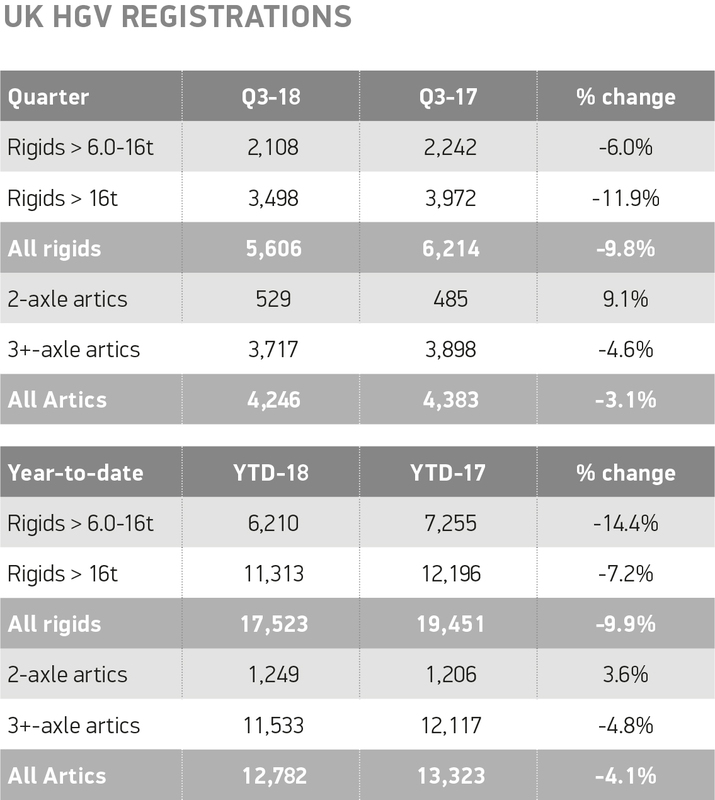 Registrations of rigid trucks declined in the third quarter, down -9.8%, with a -6.0% decrease in the >6-16T segment and a -11.9% decline in the >16T segment. Meanwhile, demand for artic vehicles also fell, by -3.1% to 4,246 units. Tractors remained the most popular vehicle, despite a -4.1% drop in demand, accounting for more than two fifths (42.8%) of the market. Skip loaders and box vans were the only segments to record growth in the quarter, up 11.1% and 2.4% respectively. It was a similar picture in the year-to-date figures, with overall HGV registrations falling -7.5% to 30,308 units, with declines in demand for both rigids (-9.9%) and artics (-4.1%). While fluctuating fleet buying cycles are a natural feature of the HGV market, given this quarter marks the fifth consecutive decline, there is no doubt that a fall in operator confidence is having an impact on registrations of these big ticket purchases. Government must address the current economic and political uncertainty if we are to get more of these high-tech, ultra-low emission vehicles on to our roads, and to ensure the sector can prosper.